The perfect treat for your loved one on love day. 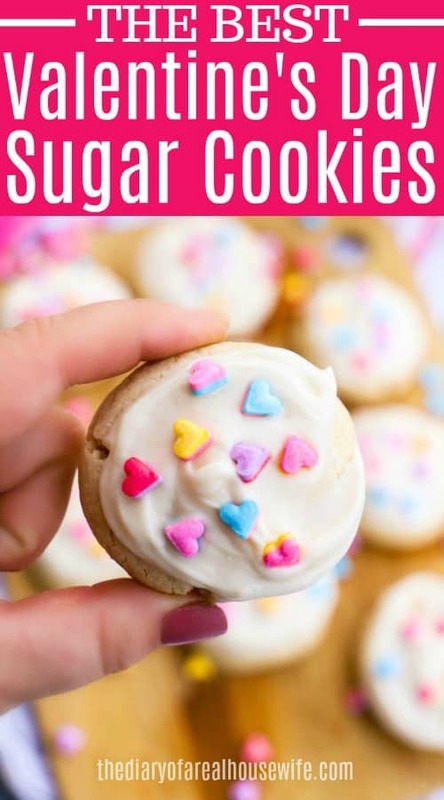 These Valentine’s Day Sugar Cookies are so simple to make. Made with cream cheese they are soft and fluffy and covered in a cream cheese frosting. I finished mine off with some festive sprinkles. It’s time to break out the hearts and all things pink. Valentine’s Day is only a few weeks away and I’m ready to celebrate. While we don’t go all out for this holiday I love making special treats with my kids and doing something to show my love for my family. 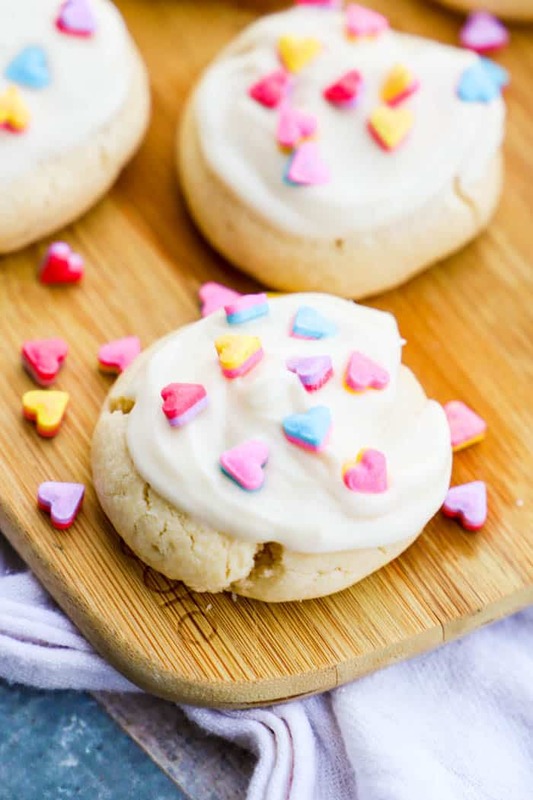 I don’t need much just a movie, a big blanket, my family, and these amazing Valentine’s Day Sugar Cookies. One: In a small mixing bowl whisk together flour, baking powder, and salt. Once it is all well combined set it aside for later. Two: Now it’s time for the wet ingredients. 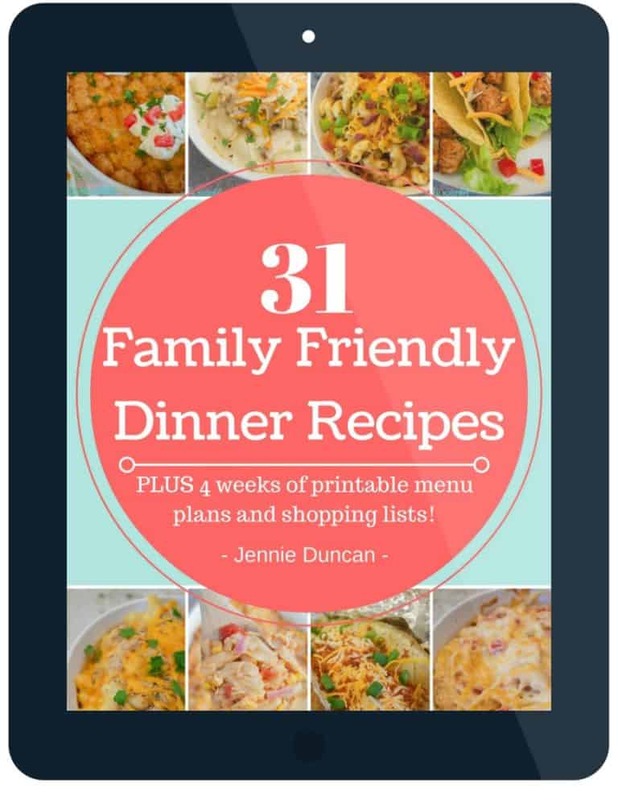 You want to start with a separate larger mixing bowl or in your stand mixer. I used a stand mixer but you can also use a hand-held electric mixer. Cream together butter and cream cheese until creamy. Next, add in sugar and continue to mix until light and fluffy. Last you want to add in your egg along with your almond and vanilla extract. Three: Slowly add your dry ingredients to your mixer with your wet ingredients until well combined. Cover and chill for 1 hour or overnight. Chilling is very important for these cookies to hold their shape so make sure you are not skipping this part. 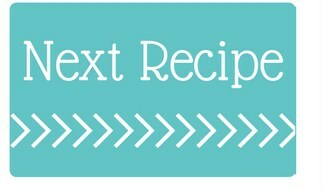 Four: Preheat oven and prepare a baking sheet with parchment paper. I bake these cookies at 350 degrees F.
Five: Next roll dough into balls. 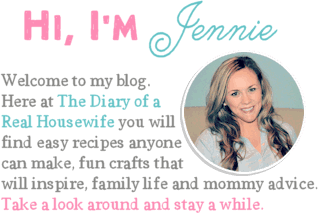 I made mine about 2 tablespoons per cookie. It’s important to make sure all cookies are the same size so they cook evenly. Place your rolled cookie dough on your prepared baking sheet. Bake for 14-15 minutes. Once baked allow the cookies to cool on the pan for 5 minutes before allowing them to cool completely on a rack. While your cookies are cooling you can get started on the frosting. Make sure to wait until your cookies are completely cooled before putting your frosting on. If you frost warm cooking your frosting will melt. Making the frosting is really easy. Cream together cream cheese and butter in a stand mixer or with an electric mixer. Add in sugar and vanilla and then continue to beat until your frosting is creamy and smooth. Once cooked are completely cooled spread on cream cheese frosting. 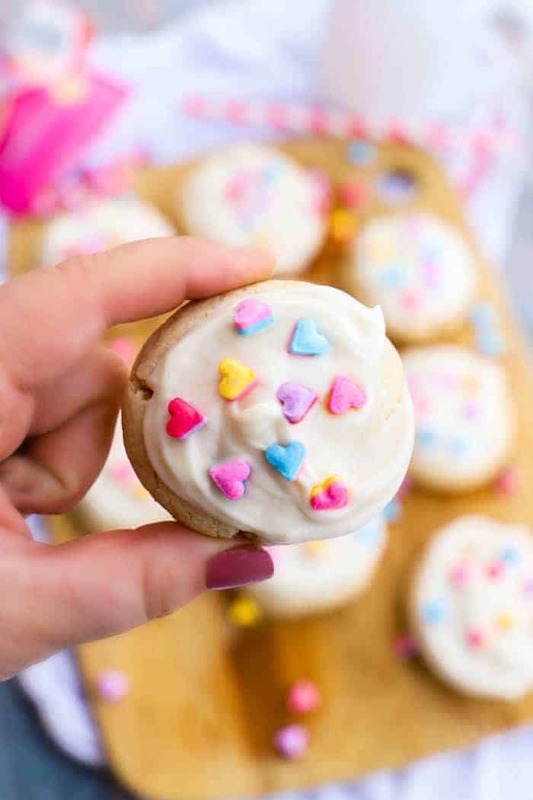 Decorate with Valentine’s Day sprinkles. In a small mixing bowl whisk together flour, baking powder, and salt. In a separate larger mixing bowl or in your stand mixer cream together butter and cream cheese until creamy. Add in sugar and continue to mix until light and fluffy. Last add in your egg along with your almond and vanilla extract. Slowly add your dry ingredients into your mixer with your wet ingredients until well combined. Cover and chill for 1 hour or overnight. Preheat oven to 350 degrees and prepare a baking sheet with parchment paper. Roll dough into balls (about 2 tablespoons per cookie) and place on your prepared baking sheet. Bake for 14-15 minutes then allow to cool on the pan for 5 minutes before allowing them to cool completely on a rack. Cream together cream cheese and butter in a stand mixer or with an electric mixer. Once your cream cheese and butter is well combined and creamy add in sugar and vanilla and then continue to beat until your frosting is creamy and smooth. Once cooked are completely cooled spread on cream cheese frosting and decorate with Valentine's Day sprinkles.